I have a virtually new (stored indoors, virtually never used) Hobie FX One...We brought the boat up to date with all the latest "Gucci" hardware...does anyone know if there is a carbon mast available from another cat? I heard rumors of a carbon mast from a 17' boat that is no longer made..cant recall the brand...anyone??Help! 1) Hall spars Nacra 17 rig cut down ~ 2'. 2) A F16 rig from Falcon marine or similar. 3) A custom Fiberfoam rig or Hall rig. Are you missing your mast? Contact Nacra dealers, you never know what they have in the ceiling or warehouse. 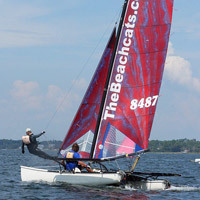 I know Key Sailing https://www.KeySailing.com has stray masts from time to time and would be a good place to start. Fully understand the stiffness and weight. Does changing to a carbon rig, place the boat as a different FX One? Or, the class rules allow carbon and if you have an aluminum, you're SOL? I would love to change mine out to carbon, but I don't want to incur the cost. Are you thinking about the NACRA Inter 17 uni rig tht was out a few year back? I thought there was one for sale at Sandy Hook Catamaran club a while back... may want to look into it..
Not all carbon masts are flexible or light. The older Nacra ones are neither, however they are good strong masts that perform well. A-Cat rigs are $5000+ fitted, less shipping. Your best bet is an F16 aluminum rig, lighter, more flexible and a wingmast. Still looking at $3500 easy. I have a Blade F-16 aluminum mast in excellent shape that I would sell for less than that. Let me know if interested. I live in Toledo, OH. I sailed a borrowed FX 1 quite a few times. Youre right though, that mast is a beast. It's the same extrusion as the Hobie Tiger but shortened. I'd look for a good F18 (wing) mast and cut it down. Or an F16. You're going to be racing Portsmouth anyway, so who cares about Hobie Class rules. That boat was a rocket up wind solo in 20 plus knots with my 250 lbs on it. Stuffing the bows wasn't that hard to recover from either. I actually was entertaining the thought of finding a Fox (FX1's big brother) to replace my N20 with. I loved the way the FX drove and handled. Got the way better set up now though with the F20C.